It is not until one explores the benefits of other cuisines that the simplicity of their cooking methods comes into view. With American style food, everything is either dumped in one pan until it congeals into a cohesive mass or the foods are segregated into individual pots and dishes without much thought to whether the flavors complement each other or not. Korean cuisine, like many Asian tastes, uses simple cooking methods to bring a variety of complementary flavors and nutrition to the table. Meals are to be savored and not rushed. The grill pan is frequently made of cast iron or heavy grade diecast aluminum and is grooved to allow fats and juices to drain away slowly. In this way, more flavor remains in the food and not in the bottom of the pan. Depending on the style of grill that is chosen, the grill can be used just for brazing meats or cooking a whole meal of meats and side dishes. Most often used on a gas stove, there are some versions that have been adapted for the electric burner. The heavy metal construction distributes heat for even cooking and cleanup is easy. It is not until one explores the benefits of other cuisines that the simplicity of their cooking methods comes into view. In American style foods, everything is either dumped in one pan until it congeals into a cohesive mass or the foods are segregated into individual pots and dishes without much thought to whether the flavors complement each other or not. Designated as an Amazon Choice product, this TeChef model combines the traditional stovetop grill pan with modern non-stick Teflon for an easy-to-clean and efficient cooking utensil. Constructed of heavy aluminum, the 12 inch diameter cooking surface can prepare more food faster than a standard skillet. Ideal for cooking high fat and low cost meats such as Pork Belly and beef ribs. It provides smokeless indoor grilling experience when used properly. Its 5-layer Teflon coating offers PFOA free use without the smell of older Teflon products. While not suited for flat surface stovetops, its deeper channels allow fat to drain away quickly for healthier food preparation and flavor retention. Its domed shape is approximately 2 inches deep and keeps fat and sauces from spilling onto the burner. TeChef is a Korean based company and has provided non-stick cookware to homes since 1982. TeChef has a global following and holds over 30 patents for its method of applying non-stick coatings in an attractive print design. Manufactured in Korea, this cauldron lid style grill pan is best used with portable gas burners. Perfect for a cook-at-the-table social gathering, the 2-piece set comes with an aluminum drip pan and cast aluminum grill plate. While the grill plate looks like a lid, the food actually cooks on the topside while the fat drains into the drip pan below. Small seasonings or vegetables such as garlic are easily grilled in the lid’s ‘handle’. The large 13.5 inch diameter cooking surface allows the preparation of large servings in a short amount of time. Adding water to the drip pan means virtually smokeless operation and the non-stick coating on the grill plate assures clean up is a breeze. Not well suited to food preparation on a traditional electric stove, when used with a gas burner, it cooks pork belly, beef short ribs, fish and other meats while reducing the fat content and retaining flavor. Another great option by CookKing, this cast aluminum pan has tips that lock and keep the plate attached to the burner. The titanium based non-stick coating makes clean up easy. Sections for cooking kimchi and other small foods are placed around the edge. The layout is great for a BBQ party and cooking a variety of vegetables and meats at the same time. Two holes on either side of the grill pan drain just enough fat away from the food to keep the calories down and the food crispy (no drip pan) This model can be used indoors or outdoors with any gas style burner. The center is slightly domed and provides approximately 9 inches for large fillets and steaks. The sides are slightly shorter than some models and the overall diameter is about 16 inches. Made in Korea, the design promotes smokeless operation and quality construction. Slightly different in design, this model provides a large square surface which is tilted to drain fats and oils to the corners. Capable of working with standard and portable gas burners, the cooking area is approximately 12 x 12 inches. The square design will accommodate larger fillets and steaks or make quick work of vegetables and sides. Made in Dongwoo and constructed of cast aluminum it has been treated with a 4-layer marble non-stick coating. Drain holes in the corner channels do not include a drip pan. The product seems to be flat on the bottom and should be stable on the burner. Country of origin is South Korean and extra shipping time is to be expected. Different in design than the previous choices, this stove and grill pan in one offers the user many options for food preparation. Charcoal can be used in outdoor setting or gel alcohol can be used indoors. The grill grate can be removed and used with a portable gas burner. Made of durable and easy to clean aluminum, one utensil can be used to prepare multiple types of Asian cuisine. Holes in the bottom allow air to circulate for even heating while the domed grill has an irregular pattern that keeps smaller foods from falling into the lower part. One of the largest grill pans in this review, the 13.7 inch diameter and concave design provide room for grilling large amounts of bacon, steak or sides at the same time. Made of cast aluminum alloy which has been treated with a non-stick coating, the dome design and grooved surface allow fat to drain away regardless of what type of protein is on the menu. The product does not come with an incorporated drip pan so a small bowl needs to be placed under the drain hole. Manufactured in the US, it is lightweight and fits easily on most brands of portable gas burners. A fine example of a multipurpose BBQ grill plate, this model is the largest of those reviewed and has a unique sectioned outer ring that allows the cooking of rice and egg based dishes. The petal design that raises food off the center dome keeps food from sitting in fat. The cast aluminum pan is slightly oblong with a drain hole at the bottom of the grilling surface. Approximate dimensions are 16 x 15.5 x 2 inches. The non-stick coating makes it easy to clean and maintain. The heavy weight (3+ pounds) means that high heat will not warp or damage the surface over time. Legs or spacers keep the grill pan securely in place when being used on a portable gas burner. Lots of room for that at-the-table BBQ party. 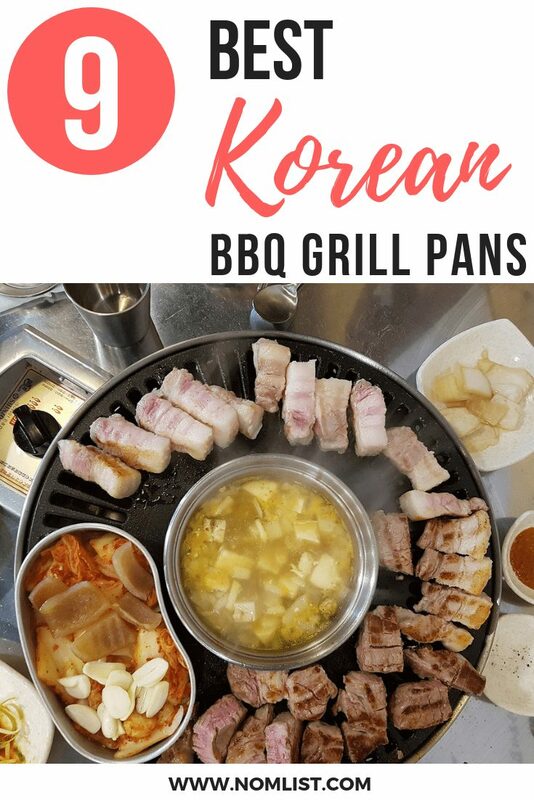 A different and unique product for this list, this grill pan made by Dongwoo has a natural stone grilling area that mimics the flavor of charcoal cooking. Made in Korea, the two-piece assembly includes a water ring that collects runoff and steams/warms foods along the outside edge. The second part includes the stone (Agalmatolite) surface and a stainless steel grilling platform. The stone absorbs fats making the surface easier to clean and maintain. The unit has a smaller cooking surface than some (approximate 12 inches in diameter) but can be easily used with portable gas burners and is virtually smoke free when water is kept in the drip pan. Product is imported and shipping may take longer than with other products on this list. Another choice of the square variety, this model is also made in Korea by Dongwoo. Similar to the one previously mentioned it has an option. Designed for the smaller meal or family, the diecast aluminum grill plate has a slight tilt to it to drain fats to the front of the appliance. It is lightweight (less than 2 pounds) and is approximately 12 x 10.4 x 0.9 inches overall. The flat bottom fits securely on the stovetop or portable gas burner and it has a non-stick coating for easy clean up. A drip cup is required to place under the drain hole for safer operation. The product does not have high sides and may not be well suited to grilling thick piece of meat or seafood. This product is imported and shipping may take longer than products inventoried in the US. Overall a good serviceable model for those who prefer a stovetop and use their grills mostly for meat. With a product as simple to use as this one, it might be hard to imagine that there is anything needed other than a good washing when done. Diecast aluminum and non-stick coatings may be preferred to cast iron but they must be seasoned or cared for in much the same way. To season a grill pan, wash with hot soap and water and dry. Before placing on the heat, rub fat or oil over the top grilling surface. DO NOT place oil where it may come into contact with flames. Allow the oil to seep into the coating and then use at a high heat. Refrain from placing anything on the grill plate until it is very hot. Brush with oil again if the pan is new or has not been used in a while. After use, clean with hot soapy water. Soaps that are designed to remove grease will cause the grill to lose its seasoning. You will need about 1 cup of marinade for each pound of beef. This version uses 2 parts soy sauce to 1 part pear juice and adds sugar, garlic, sesame oil, sesame seeds, ground black pepper and thinly sliced onion to taste. MSG (monosodium glutamate) is sometimes added for a richer flavor but can cause migraines in some adults. Add all ingredients to a large bowl and let sit for a few minutes to make sure the flavors combine well. Marinades can also be purchased and are often bottled as Korean BBQ marinade. Choose a beef rump roast or other well marbled cut and slice into thin strips. Place in a low wide pan and cover with the marinade. Remember the 1 cup marinade to 1 pound of beef ratio to make sure the marinade covers all parts. Stir the beef, until coated and let sit in the refrigerator for an hour. ** This will go quickly so make sure you have all the utensils and supplies you need before starting. Set up the grill plate either in charcoal or using a gas burner and get it hot. Brush oil over the grill pan to season the grill and prevent sticking. To test the temperature, place a drop of water on the grill. If it sizzles and dances across the grill, then it is hot enough. Using tongs or a two-prong fork, add beef and onions in a single layer across the grill, As the edges turn brown, the meat can be turned until it is cooked evenly. Generally, cook time is between 3 and 6 minutes. Complete the meal by cooking vegetables or providing sides that complement the thin and richly flavored meat.